While comfort and sound quality earn top marks, it's subdued bass and quiet microphone are its only flaws. SteelSeries has been a staple in the gaming peripheral market for long time. They've manufactured keyboards, mice and, of course, headphones. The Siberia V2 is a great example of the company's craftsmanship, as it has been the go-to value headset among gamers for the past several years. Recently, SteelSeries launched the successor to the Siberia V2, with their new Siberia V3 headphones, which have an MSRP of $100. Does the new Siberia bring anything new to the table? Or is it a boring refresh? Read on to find out! Looking at the Siberia V3, it looks exactly like the Siberia V2. The headstrap, earcups, and color combinations haven't changed at all. This time around, SteelSeries is touting that the V3 comes with memory foam in its earcups for added comfort during gaming sessions. I enjoyed using the V3 for a long 2-3 hour gaming runs because of these super-comfy earcups. I really liked the V3's overall light weight design, which helps to ease tension away from the user's ears. Many other headphones are a lot heavier than the V3, and they tend to feel heavy over your ears for long periods of time. If you're looking for comfort these are the headphones to get. I love how SteelSeries made the V3 have a low profile 3.5mm headphone jack, which makes it easy to fit into almost any audio jack. Many headphones come with beefy 3.5mm jacks, making them hard to use on a phone or tablet with a bulky case. The audio quality of the V3 is the headset's weakest point. The highs and mids are what come in clear when listening to music or gaming, but the lows and bass are not well defined. Compared to Audio Technica's ATH-M50 headphones, a benchmark for $100 headphones when it comes to overall sound quality, the bass on the V3 is poor at times. The V3 is much more comfortable than the ATH-M50 though, as it makes the ATH-M50 feel twice as heavy by comparison. The microphone does a great job of isolating your voice when speaking. I didn't like how the mic picked up my voice at a very low volume though. If people want to hear you loudly they'll need to crank up their sound system, or you will need to tweak your microphone settings to amplify the V3's mic. I ran the V3 through my Creative Sound Blaster Z sound. After I adjusted the microphone settings my voice came in loud and clear. The V3 is right in the middle of SteelSeries' lineup, but we got a chance to take a look at the company's $60 budget offering, the Siberia Raw Prism. The first thing to note is that the Raw Prism comes with color customizable earcups, which have LED circles that can be changed up to 16.8 million different colors. The downside to this budget headset is that it comes with a USB audio interface, instead of your tradition 3.5mm input cables, which means you can't use it with a sound card as result. It's not quite as comfortable as the Siberia V3, and like the V3 it also comes with an integrated microphone. So if you don't have the budget for a $100 headset the Raw Prism, but it falls short on audio quality and sound interface. Running a headset through a soundcard via 3.5mm will always be better than any USB audio interface, but the Raw Prism does a good job of rendering sound, and it should be looked at as the go-to budget option for gamers. When you look at the headphone market it's very competitive in the $100 price segment. Audio Technica's ATH-M50 headphones are $120 street and Sony's MDR-V6 are $110. Both of these headphones provide a better audio experience, but they lack the integrated microphone of the V3. However, both headphones aren't as comfortable to wear as the V3. The comfort of the V3 is its defining factor. If audio quality is something you prioritize then go with the ATH-M50 or MDR-V6. Both are great entry level choices for audiophiles, but again they lack an integrated mic. These headsets, however, won't be as comfortable as SteelSeries Siberia V3. The Siberia V3 leaves you wanting a little more bass. It sounds toned down compared to full sound I got from Audio Technica's ATH-M50. 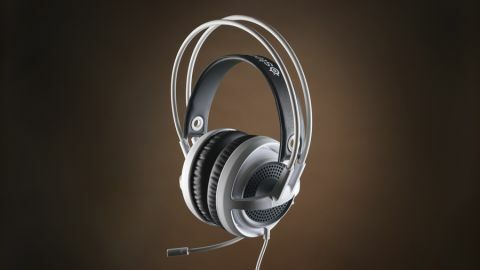 For $100 you get a set of lightweight headphones for long gaming sessions. The audio quality leaves something to be desired, and the microphone could be better, but overall the Siberia V3 is a solid gaming headset. Those wanting a headset that can stay comfortable for several hours won't find a better one than the Siberia V3.